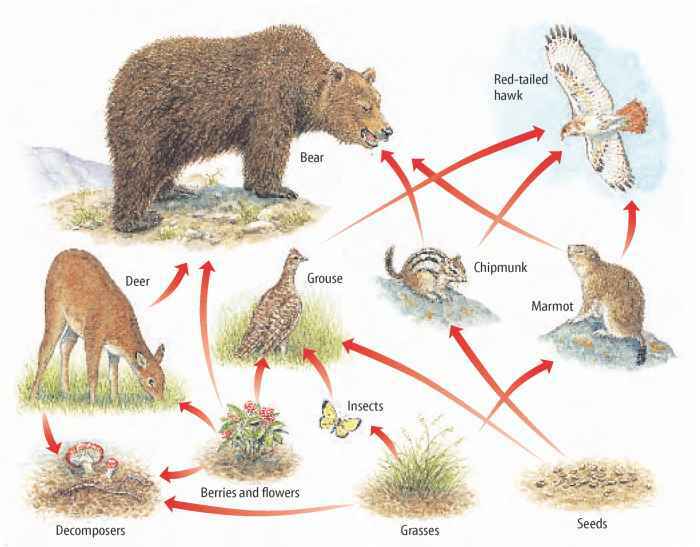 Since microbial growth is controlled mostly by chemical reactions, and the nature and rate of chemical reactions are affected by temperature, the rate of microbial growth and total biomass growth are affected by temperature. 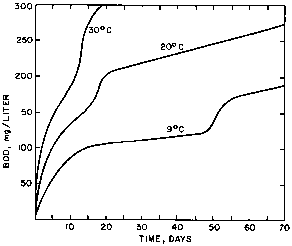 The microbial growth rate increases with temperature to a certain maximum where the corresponding temperature is the optimum temperature (see Figure 7.22.2). Then, growth does not occur after a small increase in temperature above the optimum value, followed by a decline in the growth rate with an increase in temperature beyond the optimum. FIG. 7.22.2 Progress of BOD at 9°, 20°, and 30°C. The break in each curve corresponds to the onset of nitrification. and Eddy, Inc. 1991). In their respective classes, facultative thermophiles and facultative psychrophiles are bacteria that have optimum temperatures that extend into the mesophilic range. Optimum temperatures for obligate thermophiles and obligate psychrophiles are outside the mesophilic range. where B is an integration constant. where O is the temperature coefficient.